International Journal of Research in Health Sciences,2015,3,1,89-93. 1-Associate Professor, Department of Clinical Nutrition and Dietetics, PSG College of Arts and Science, Civil Aerodrome Post, Coimbatore, Tamil Nadu 641014, INDIA. 2-Msc , Department of Clinical Nutrition and Dietetics, PSG College of Arts and Science, Civil Aerodrome Post, Coimbatore, Tamil Nadu 641014, INDIA. 3-PhD Scholar, Department of Clinical Nutrition and Dietetics, PSG College of Arts and Science, Coimbatore, Tamil Nadu, 641 004, India, INDIA. 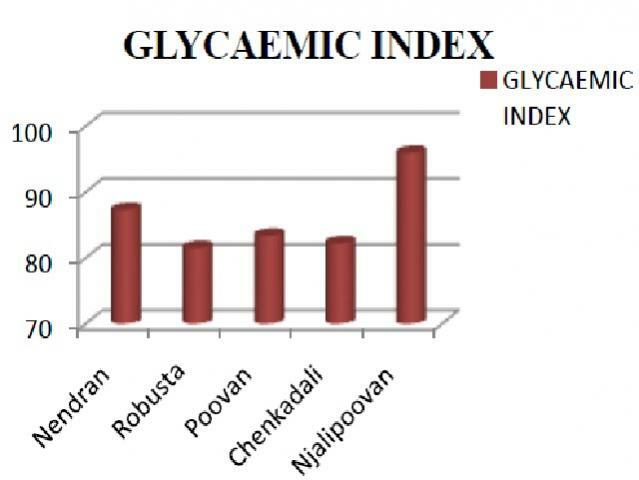 The glycaemic index (GI) is a physiological measure of a foods potential to increase postprandial blood glucose, as compared to the effect produced by food taken as reference, such as glucose or white bread. Currently researchers and consumers are interested in low GI foods, since their consumption is associated with better weight control and reduced risk of incidence of chronic diseases, like diabetes. In the present study, the GI value for “Banana” such as ‘Njali poovan’, nendran’, ‘poovan’, ‘robusta’ and ‘chenkadali’ was estimated in the selected healthy volunteers. By convenient sampling 20 female non-diabetic healthy adult volunteers were selected. Standard glucose and selected banana varieties were given on two different days respectively and their blood sugar levels were monitored using glucometer for different time intervals. With the obtained results, GI and GL were found out. Then the data collected were analysed using independent‘t’ test tool of SPSS 16 version. The highest GI was recorded by ‘Njali poovan’, followed by ‘nendran’, ‘poovan’ and ‘chenkadali’. The lowest was recorded for ‘Robusta’. ‘Poovan’ and ‘chenkadali’ was recorded for the highest GL, followed by ‘nendran’ and ‘Robusta’. ‘Njali poovan’ was recorded for the least GL.